THE BIG DATA SEMINAR 2015 ! 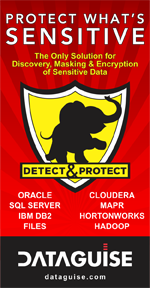 Why so many Versions of HADOOP: Apache, IBM, Oracle, Google, Amazon, etc. Since the dawn of time up until 2003 mankind has created 2 exabytes of data, but today at least that much data is created each and every day. This means that standard traditional databases and tools cannot process the huge volumes of data, nor can they discern and separate the “High Value” from the “Low Value” data in order to support analytical insights. David Menninger of EMC says "we used to ask whether we could afford to store information...today we ask whether we can afford to throw it away ". Five years ago, a scalable relational database cost $100k per terabyte and $20k per year maintenance, but today you can store the same amount of information for $1200 per year. It is no longer a technology decision but an economic one as the technical capabilities have progressed light years ahead in a relatively short amount of time. The world of Data Warehouse has been evolving rapidly over the last three years into an ecosystem that is architected with traditional data, Big Data, real time data, semantic interfaces, complex algorithms, new infrastructures and serves the analytical needs of users including mobile platforms. This seminar will be a two-day interactive session on how to understand the impact of Big Data on Data Warehousing. Does every enterprise need to adopt to the new evolutions of the Data Warehouse? Do the new components of the Data Warehouse provide real additional insights that can be harnessed to enable transformations in the enterprise? Does ETL have a future? How does one build new analytical platforms? Who is a data scientist and what role should that person play in your architecture? According to James Kobielus, IBM's Big Data Evangelist, today's BIG DATA Developers must wrangle with a plethora of SQL-Like languages for big data access including HiveSQL, Cassandra QL, JAQL, SQOOP, Sparkll, Shark and DrQL. How do you navigate across the myriad of products and available tools? How can the Forrester Wave Vendor Ranking and Evaluation Criteria be used to study and select what is best for your organization's needs? What types of applications are typically being implemented? According to Ralph Kimball, "Data Warehousing has been demonstrating the value of data-driven insights for at least 20 years, ...but recently "many enterprises are looking seriously at unstructured data for the first time..." and it is going mainstream. How do you effectively link unstructured data, semi-structured data and classical relational data together to support your information architecture in order to meet the business needs and goals of your organization? This seminar provides you a one of kind perspective on both the business and IT side of Big Data and the Data Warehouse. It includes live examples and real world case studies that will enable you to understand this subject. You will gain insights into the new world of Data Warehouse, how the new technologies are changing the way we design and build data warehouses, what will the new generation of reports and analytics look like and who are the companies that have forayed into this new world. This two-day seminar will address these questions and many others related to BIG DATA. Practical approaches and techniques are contained throughout the presentation on the business, technical, and organizational aspects of Big Data. It will also address the skill sets required to support BIG DATA applications and BIG DATA Architectures. The seminar format is very interactive with attendee questions encouraged throughout the day, and attendee experiences shared as time permits. Mr. Krishnan is a recognized expert worldwide in the strategy, architecture and implementation of high performance data warehousing and database solutions. As Special Advisor to Bill Inmon (“The Father of Data Warehousing”) and TDWI Instructor and Author (The Data Warehouse Institute), he is a visionary data warehouse thought leader, ranked as one of the top 25 data warehouse consultants in the world, and an independent analyst, writing and speaking at industry leading conferences, user groups and trade publications. He has authored three eBooks, over 125 plus articles, viewpoints, whitepapers and case studies in Big Data, Business Intelligence, Data Warehousing and Data Warehouse Appliances and Architectures. He has co-authored a book with Bill Inmon entitled “Building The Unstructured Data Warehouse”, the ground-breaking publication upon which Bill Inmon’s “Unstructured Data” Seminar is based. A recognized authority on Unstructured Data Integration, text mining and text analytics, along with Bill Inmon, he is promoting the next generation of data warehousing, primarily on DW 2.0 platforms with unstructured data integration and social intelligence as key areas in BIG Data and Analytics. Specialties: Performance Tuning VLDBs (250TB+), Social Media Analytics, High Performance Data Warehouse Architecture and Design, Hadoop, BIG Data, NoSQL, Text Mining, Deep Network Analytics, Neural Networks, Artificial Intelligence. Look for Krish Krishnan's articles on BIG DATA Analytics as Data Management Forum will be working with other publications during the 2014 timespan including IBM's Data Magazine, Information Management Magazine (Source Media) and DataBase Trends and Applications Magazine, as well as publishing many of these articles in the Data Management Forum eNewsletter. This seminar is intended for business and IT Management and Executives and Technical Staff Interested in the Concepts and Usage of BIG DATA including: Project Directors, Data Warehousing, Data Architecture or Database Management executives and staff, Developers, Managers and Technicians responsible for planning, design and implementation, Data Stewards and Custodians, Architects, Metadata personnel, and anyone looking for a clear concise overview of data management and architecture as it relates to BIG DATA tools, technologies, techniques and applications. This is a "One-of-a-Kind" Intensive Tutorial Assuming no pre-requisite knowledge of BIG DATA. 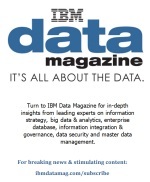 IBM Data Magazine, DAMA International, Inmon Consulting, and various other supporting organizations.